Tradition has it that the church name was in honor of Father Edward Francis VanHootegem and St. Isidore, the Farmer, on whose feast day, May 15, the land for the parish was purchased. Father Edward Francis VanHootegem was born March 3, 1856, in Belgium, son of Peter John and Sophia (De Smet) Van Hootegem. On September 8, 1881, he was appointed by Bishop Krautbauer to the parish of St. John the Baptist, Duck Creek, and to its mission at Flintville. Father VanHootegem celebrated Mass for Catholics at Flintville in homes, in a shanty, and in a hall. Soon the small congregation agreed to build a church. The property was purchased on the feast of St. Isidore the Farmer, May 15, 1883. To cover the costs, a contract was made among the members of the congregation, “…he who would pay five dollars cash in a fortnight from the day of the meeting should have a right to one lot sixteen by sixteen in the cemetery to be laid out on the bought property.” By doing this, sufficient money was secured to pay $200.00 for the land. There were on record 18 people that contributed money. A Harvest Festival was held that fall to help defer expenses. During his tenure of 11 years nurturing the mission in Flintville, it was Father VanHootegem’s fervent wish that the church at Flintville obtain its own pastor. “The congregation at Flintville…could support a priest if they were helped by the Poor Priest Fund for a couple of years.” VanHootegem, July 1892. 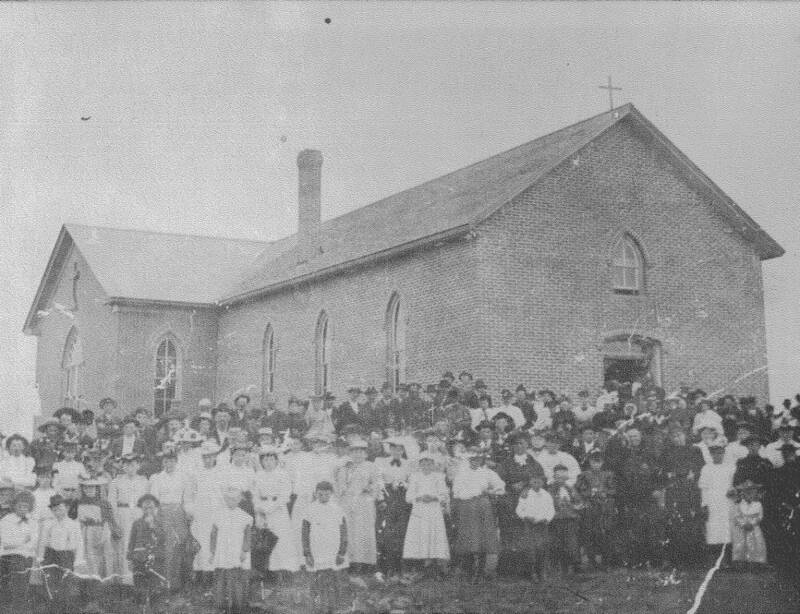 In 1895 Father Arthur Belle, then pastor at Duck Creek, and pastor for the mission church in Flintville, arranged for the construction of an addition to Ss. Edward and Isidore Church. The members felt a larger church and a parsonage might help them procure a resident pastor. It did. Father Francis Laslow (1895-1897) was appointed resident pastor and moved into a one-and-a- half story rectory. On February 6, 1896, the board of directors of Ss. Edward and Isidore Parish convened and a motion was made and accepted to adopt the “Revised By-Laws of Incorporated Congregations of the Diocese of Green Bay as printed on March 31, 1890.” The church was now incorporated. In 1958 Ss. Edward and Isidore Parish transitioned from pastor Father Casimir Krauklis (1956-1958) to Father Michael Fetko (1958-1969) and celebrated their 75th Anniversary as parish. A solemn High Mass was celebrated on September 6, 1958, with Bishop Stanislaus V. Bona as a special guest. A banquet was served following Mass featuring roast turkey “Flintville-style” with special jubilee ice cream. For this occasion the interior was painted and redecorated and new lights were installed. The parking lot was resurfaced, new walks were laid, and a new cross was fitted on the steeple. Over the next years Father Ralph Merkatoris (1969-1971) served Ss. Edward and Isidore. He often told us, “Flintville was my first parish – and my first love. The people were great and so willing to help.” Then the Bishop assigned Father Sylvester Borusky (1971-1973) to Flintville. The faith community grew and the old church was too small for the congregation. Father Robert Karuhn (1973-1975) directed the planning and construction of a new facility. The new church was built on the site of the original church and rectory. The new church seated 400 with a formal dedication and Mass celebrated on February 3, 1974, by Bishop Aloysius J. Wycislo. The mortgage for this structure was paid in five years. The parish again decided to pick up the custom of the early parishioners and have a Harvest Fest. Every fall since 1973 the parish sponsors this event to retire debt and pay for new programs. During the next several years the need for expanded parish facilities with more classrooms was discussed. Father Henry Bedesem (1975-1982) was pastor and soon ground was broken for the new addition in August of 1979. The new parish center was built at an approximate cost of $300,000 and two Directors of Education were hired. The formal dedication and blessing was held on July 23, 1980, with Bishop Wycislo officiating. Under the leadership of Father David Kasperek (1982-2012) the parish swelled in numbers. To serve this growing number of parishioners, Father Kasperek, along with the Parish Council, hired a Pastoral Associate, Director of Music, Business Administrator, Maintenance Coordinator, Marriage Enrichment Coordinator, Sacristan, and a Parish Nurse. In 1987 long-time parishioner Earl Kunzer was ordained a permanent deacon. Deacon Earl Kunzer served the parish as permanent deacon from his 1987 ordination to his death in 2011. Continuing under the long-range plan in 1991-1992, a new rectory was constructed for $80,000. On Easter Sunday, April 7, 1996, ground was broken for a new 850 seat, $1.5 million church and building upgrades. Father Kasperek stated, “The date of the breaking ground was chosen as deliberate symbolism for the event. Easter is the breaking forth of a new life. And when a church has to build, it’s the best expression that the church is alive. When the walls are being broken out to make room for the people, then obviously the Lord is alive and well.” On the first Sunday of Advent the parishioners celebrated Mass in the new worship space. The cross behind the altar is made from the original hand hewn beams from the old church. The original stained glass windows give light to Resurrection Hall. In 1999 the church added air conditioning for a price of $30,000. Also that year, a parishioner donated a baby grand piano for the music ministry. In 2000 a major parking lot expansion was added and in 2001 a $20,000 life-size statue of the Holy Family was donated through memorials and placed in the new worship space along with new Stations of the Cross. In 2003 the parish held a “Burn the Mortgage” celebration and continues that spirit of stewardship with outreach for projects from Flintville to Mexico to India. A Memorial Garden was added to the south side of property in 2006. In 2010 SS Edward and Isidore Cemetery purchased .8 acre for more space in the new section of the cemetery. Memorials paid the $13,000 for new statues of SS Edward and Isidore, placed in the gathering space of the church. A statue of Mary, Our Lady of Lourdes, was donated and placed on the lawn, close to the original spot of the first grotto to honor the Blessed Virgin Mother Mary. In 2012 Father David Hoffman was appointed pastor and says that the history of the parish and the changes that take place are only symbolic of the people. Through a memorial, Father Hoffman supervised the purchase and installation of a corpus on the hand-hewn beams of over 100 years ago. Father noted that a church is a body of believers who have been called to live and serve as Jesus did. This group of believers, under the banner SS Edward and Isidore Parish, works with the Holy Spirit to be formed into Christ and continue His love and service. The people continue to be the real treasures of this parish’s history!